conducted by the human rights organisation Worldview Rights. The outbreak of armed conflicts in northern Myanmar in November 2016 came at a critical time in Myanmar's peace process. Police in Myanmar’s northernmost Kachin state have increased security amid fighting by four ethnic militias that had joined forces to attack government targets in neighboring Shan state, leaving 10 dead and forcing thousands of residents to flee their homes. The Kachin Independence Army (KIA), Ta’ang National Liberation Army (TNLA), Myanmar National Democratic Alliance Army (MNDAA), and Arakan Army (AA) launched coordinated attacks on military outposts, police stations, and a trade center in Muse and Kutkai townships in northern Shan state. The four militias on 21 November 2016 released a joint statement requesting civilians in the area to take precautions. The statement also said that the Myanmar military had continued to attack ethnic armed groups, including those that signed a nationwide cease-fire accord with government in October 2015. The government excluded the AA, MNDAA, and TNLA from signing the agreement. Activities along the 105-mile trade zone southeast of Muse in Shan state’s Kutkai township came to a standstill because of the clashes, and the militia groups have warned locals not to travel. Some of the ethnic groups that were at odds with the Myanmar government have populations on both sides of the China Myanmar border. The demands of ethnic groups range widely with some striving for independence and others increased autonomy. The latest armed conflicts exerted negative pressure on the national reconciliation advocated by Aung San Suu Kyi, leader of Myanmar's National League for Democracy (NLD). All in all, the four ethnic armed groups may intend to use the efforts of Suu Kyi, the NLD and China to force Myanmar troops to make concessions so that the rebels can secure their occupied areas. From November 2013, the Myanmar government and armed ethnic groups have held nine rounds of peace talks and eventually reached a national cease-fire agreement. By November 2016, eight groups had signed the agreement. In April 2016, Suu Kyi expressed her hopes for convening a national reconciliation conference like the 1947 Panglong Conference and making more ethnic armed groups join the cease-fire agreement. On August 31, the 21st Century Panglong Conference held its first meeting and announced the conference will be held every six months, in the hope that complete peace can be achieved across Myanmar by 2019 or 2020. All members of the United Nationalities Federal Council (UNFC), an alliance of nine ethnic armed groups that did not sign a nationwide cease-fire agreement with the previous government in October 2015, attended the peace conference in order to participate in political dialogue so it can push for the formation of a federal union in Myanmar. The Ta’ang National Liberation Army (TNLA), the Myanmar National Democratic Alliance Army (MNDAA) and the Arakan Army (AA) were not invited to participate because they have refused to lay down their arms in advance of the talks. 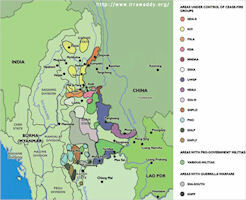 Ethnic minorities make up about a third of Burma's population of roughly 50 million. 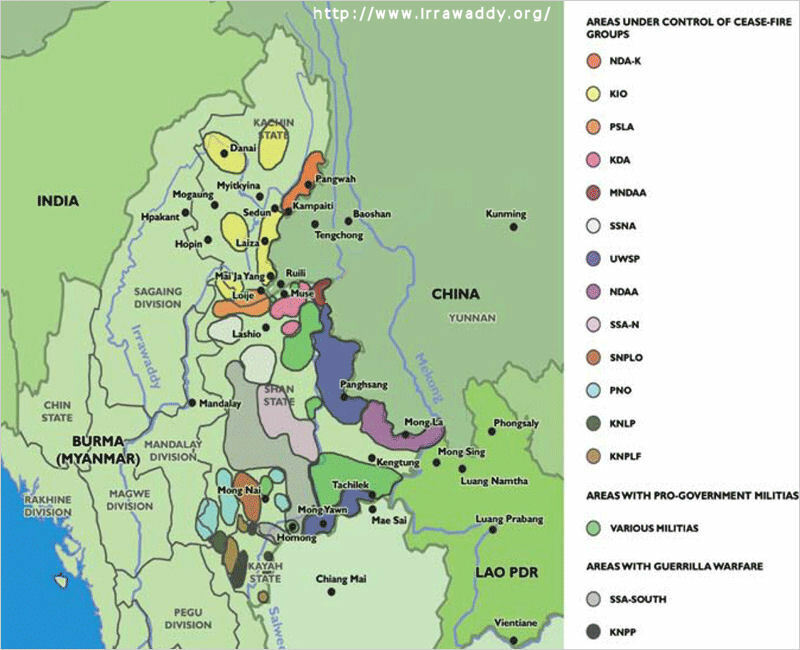 Ethnic minorities live throughout Burma, but are concentrated mainly in the seven states and divisions named after the Shan, Kayah, Karen, Mon, Chin, Kachin, and Rakhine ethnic groups. National identity cards, which all Burmese must carry, and passports generally indicate the ethnicity of non-Burmans, either explicitly or through the use of personal titles in ethnic minority languages rather than in Burmese. Circumstances of history have contributed to the difficulty of party and government efforts to unify the nation. Over the past millennium, three dynasties dominated by ethnic Burmans succeeded for relatively brief periods in imposing their political authority over the area within the boundaries of the modern political state, and at times these dynasties expanded to the east and west considerably beyond those perimeters. During the Konbaung period, the Shans, Chins, Kachins, Kayahs, and other peoples had been linked to the royal court in a tributary relationship that did nothing to limit the local authority of their rulers. The British policy, developed first in India, was to interfere as little as possible in the internal affairs of the minority groups and to separate their administration from that of Burma Proper. Thus when the dyarchy system was introduced in 1923, the Burma Frontier Service was created with its own corps of civil servants. In the 1937 constitution "Ministerial Burma" (Burma Proper, which was included in expanded self-government) and the peripheral border areas were further segregated. Not until the Union of Burma was formed in 1948, however, had all the diverse peoples within its ill-defined borders formally been brought together in a single, if somewhat tenuous, federation. The government has a contentious relationship with Burma's ethnic groups, many of which fought for greater autonomy or secession for their regions after the country's independence in 1948. At the time of independence, only Rangoon itself was under the control of national government authorities. Subsequent military campaigns brought more and more of the nation under central government control. Signed by General Aung San and representatives from the Kachin, Shan and Chin communities in February 1947, the Panglong agreement promised these groups a fair amount of autonomy over their own affairs in exchange for their support for Burma’s independence. This agreement allowed for a large degree of self-governance and the option to withdraw from the federation after a decade. That agreement forms the legal basis for demands for self-governance today. Aung San’s death just months later brought an end to the dream of Panglong, as his successor U Nu never fully implemented the agreement, in particular the promise of local autonomy. Given the difficulty of finding an acceptable solution to the problem of political and ethnic diversity, it was not surprising that the new leadership was unable to reconcile the differences and that the resilience of the newly forged union was tested almost immediately. Within several months of independence, communist bands were in armed rebellion, seeking to overthrow the central government. Several months thereafter, elements of the Karen minority-the largest of the discontented ethnic groupslaunched their own revolt, as did members of other ethnic minorities, all seeking a territory for their own group and greater decisionmalong authority in matters affecting its future. Wholesale Karen desertions played havoc with Burma's armed forces, and dissidents soon occupied much of Lower Burma and spread elsewhere. By 1951, however, in part because the insurgents were never able to unify their efforts and in part because of U Nu's determined response, the reconstructed armed forces had brought the insurrection substantially under control, although insurgents continued to dominate much of the countryside. For over six decades, the army has battled diverse ethnic insurgencies. These ethnic minority insurgent groups have sought to gain greater autonomy, or in some cases, independence from the dominant ethnic Burman majority. The Government justifies its security measures as necessary to maintain order and national unity. However, most major insurgent groups have reached individual accommodations which provide varying levels of stability and autonomy from central government control. The Government reinforced its firm military rule with a pervasive security apparatus led by the military intelligence organization, the Directorate of Defense Services Intelligence (DDSI). Control is buttressed by arbitrary restrictions on citizens' contacts with foreigners, surveillance of government employees and private citizens, harassment of political activists, intimidation, arrest, detention, and physical abuse. The authorities continued to regard the Muslim and Christian religious minorities with suspicion. Moreover, there was a concentration of Christians among some of the ethnic minorities against whom the army fought for decades. Religious publications, like secular ones, remained subject to control and censorship. Those residents unable to meet the restrictive provisions of the citizenship law, such as ethnic Chinese, Arakanese, Muslims, and others must obtain prior permission to travel. Although in practice the distinctions between the various insurgent groups were often blurred, all could be classified as one of three kinds according to their organizational goals. The revolutionary movements were established to overthrow the existing central government and create a new structure in its place. By the early 1980s, U Nu's movement being definct, only the Burmese Communist Party [BCP] was representative of this kind. Ethnically rooted insurgencies were legion. In fact, it has been said that in Burma, if a group was ethnically distinct from the Burmans or other ethnic groups, then it would be represented by at least one insurgent movement. Unlike the revolutionaries, ethnic insurgents were interested only in ruling their own people and territory and sought either greater autonomy from the central government or outright independence. Warlord associations were organized feudally around one or more leaders in order to conduct illicit market activities and control trade routes. These were essentially armed economic enterprises and inclued, among others, the Chinse groups and the Shan United Army. The distinction between armed economic enterprises and others came to be less clear-cut in the mid-1970s, as it became very difficult to distinguish the problems of insurgency from those of the black market network and the international narcotics trade because most anti-govermnent groups were heavily involved in one, if not both, pursuits. For some groups, this was not a new development; they had always been armed commercial enterprises. Most ethnic insurgents and the communists, however, had organized for political purposes. Although they often had engaged in smuggling, permitted poppy cultivation in their areas, or allowed passage of opium caravans through territories they controlled, most clearly had not been oriented primarily toward illicit commercial activities.. Despite differences in basic goals, the day-to-day operations of most groups were often indistinguishable because all had to devote significant resources and attention to supporting themselves. The raison d'etre of warlord groups was precisely that, of course, and they were not troubled by the need to balance any other considerations. As became clear in the late 1970s and early 1980s, however, other groups often found that administering commercial interests could work to the detriment of maintaining group cohesiveness. Even incidental participation in commerce appeared to carry temptations for deeper involvement, leading to the development of rivalries between individual entrepreneurs. Political ideals were also undermined as some group members became more interested in securing profits than in working to achieve political goals. Moreover, the complexity of black market and opium trade operations created attractive opportunities for individuals to set up their own specialized operations, either as a sideline activity or as an independent splinter organization. In 1989 the govenment began a policy of seeking cease-fire agreements with most ethnic insurgent groups along the borders, and the regime entered into a series of ceasefire agreements with insurgent groups, though a few armed groups remained in active opposition. Following the breakdown of its cease-fire with the separatist Karenni National Progressive Party (KNPP) in 1995, the army began an offensive in 1996 against the KNPP that continued through year's end. As part of its campaign to deny the guerrillas local support, the military forces forcibly relocated hundreds of villages and tens of thousands of Karenni civilians. In central and southern Shan state, the military forces continued to engage the Shan State Army (SSA), a remnant of Khun Sa's narcotics-linked former Mong Tai Army, and began a campaign of relocation against the villagers in the region. Many thousands were forcibly removed from their villages. There are credible reports of retaliatory killings, rapes, and other atrocities committed by the army against civilians. The Karen National Union (KNU) was the largest single insurgent group that continued to fight against central government rule. In 1997 cease-fire talks between the KNU and SLORC broke down and were followed by a the SLORC offensive that pushed the KNU out of its last strongholds in Karen state. As a result, over 20,000 Karen civilians fled to Thailand. The Government denied responsibility for attacks on Karen refugee camps in Thailand that were carried out by the DKBA. However, according to credible reports, the DKBA receives military support from the Government. In conjunction with the military's campaigns against the Karen, Karenni, and Shan insurgents, it was standard practice for the Government's armed forces to coerce civilians into working as porters in rural areas in or near combat zones. According to testimony collected by international human rights nongovernmental organizations (NGO's) from refugees, the men--and sometimes women and children as well--who were forced to labor as porters often suffered beatings. On occasion, they died as a result of their mistreatment by soldiers. There were reports that soldiers raped some female members of ethnic minorities in contested areas. In regions controlled by insurgents groups such as the Shan state, or in areas controlled by groups that have negotiated cease-fires with the Government such as the Wa territory, there were credible reports that these groups engaged in narcotics production and trafficking. In combat zones or in areas controlled by ethnic minorities, the insurgents subjected civilians to forced labor. Antigovernment insurgent groups were also responsible for violence, including deploying land mines and conducting ambushes that caused both civilian and military deaths. The SSA insurgents committed retaliatory killings, rapes, and other atrocities against civilians. Karen National Union troops reportedly are led by child soldiers. Cease-fire agreements helped to curb armed conflict. Burma's military government had reached cease-fire agreements with as many as 17 of the country's rebel groups. Many of the agreements were reached in talks with officials led by Prime Minister Khin Nyunt. He was ousted in 2004 and placed under house arrest. In late May 2005 two of Burma's ethnic Shan rebel groups joined forces - one breaking a cease-fire with the military government - as they stepped up their struggle for an independent state. The move raises fears of renewed violence in Burma if other rebel cease-fire agreements break down. The Shan State National Army, or SSNA, and the Shan State Army agreed to join forces. The agreement between the two rebel groups ended the SSNA's decade-old cease-fire pact with Burma's military government. The SSNA accepted a cease-fire in 1995 on the condition that its troops could keep their arms. But Burma's military in early 2005 called on the Shan to disarm. In February 2005, to add pressure, the military government arrested several Shan leaders and charged them with treason. Since the military government came to power in late 1988, at least 17 anti-government major ethnic armed groups and over 20 small groups were claimed to have returned to the legal fold by signing respective ceasefire agreements with the government. Under the government's fifth step of its seven-step roadmap announced in 2003, a multi-party democracy general election is to be held in 2010 in accordance with the 2008 new state constitution to produce parliament representatives and form a new civilian government. The 2008 new state constitution prescribes that all the armed forces in the union shall be under the command of the Defense Services. In 2009, the regime began pressuring ceasefire groups to join a Border Guard Force (BGF)--an integrated unit of Burma Army and ceasefire group soldiers, with Burma Army soldiers occupying the key positions; no major ceasefire group has agreed to these demands. In June 2009 the Burma Army and its affiliate, the Democratic Karen Buddhist Army, launched an attack against the Karen National Union. In August 2009 the Burma Army defeated the Myanmar National Democratic Alliance Army, an ethnic Kokang group, in an offensive in which thousands of people fled to China and the Burma Army destroyed a weapons and narcotics processing facility in the Kokang region. In the wake of the November 2010 elections, the Burma Army launched a series of attacks against armed ethnic groups in Karen and Shan States. In June 2011, fighting broke out between the Burmese Army and the Kachin Independence Army in northern Burma’s Kachin State with clashes continuing as of August 2011. President U Thein Sein's peace offer was extended in August 2011. By early 2012 a total of 12 armed groups had respectively signed preliminary peace agreements with the government at state or central levels. Under the president's peace offer, peace making is being carried out in three phases -- the first phase is to ceasefire, set up liaison offices and travel without holding arms to each other's territory; the second phase is confidence building, holding political dialogue, implement regional development tasks in terms of education, health and communication; and the third phase is to sign agreement for eternal peace in the presence of the parliament represented by nationalities, political parties and different walks of life. At the end of 2012, the government had reached preliminary cease-fire agreements with all major armed ethnic groups except the KIA in Kachin State, where armed conflict continued and escalated in December 2012. Although peace talks are taking place, there seemed to be no end in sight in the war against the ethnic rebels, especially in Kachin State and the Shan State. The President Thein Sein Government reached a truce with the Shan State Army (SSA), but the Burma Army was reluctant to accept the agreement. A tentative peace agreement on May 31, 2013 between Burma's government and Kachin rebels was hailed as a breakthrough after recent intense fighting along the border with China. The pact was one of the last to be reached with armed ethnic groups, raising hopes of a nation-wide peace. Twelve of Myanmar's ethnic rebel groups announced 02 December 2014 the establishment of a Federal Army, a move likely to anger the national government. The new force, called the Federal Union Army (FUA), will be under the supervision of the United Nationalities Federal Council (UNFC), an umbrella group that has been trying to negotiate a nationwide cease-fire between ethnic minorities and the national military. Among the country's major ethnic rebel groups, only the Wa have refused to participate in the FUA. The government in Myanmar, also known as Burma, offered 11 December 2014 to restart peace talks with ethnic rebels. The minister responsible for the talks made the offer to the rebel Nationwide Ceasefire Coordination Team (NCCT), the umbrella group that represents several ethnic groups. The two sides had met several times since the NCCT was founded in July 2014, but there had been no reported progress. A group of ethnic militias decided on 24 February 2017 not to sign the Myanmar government’s nationwide peace pact on the last day of their three-day summit at the headquarters of the country’s strongest ethnic rebel force, but instead formed a committee to discuss a “new path to peace,” a military official from the conference said. Leaders from seven ethnic militias that have not signed the government’s October 2015 nationwide cease-fire agreement (NCA)—including the Kachin Independence Organization (KIO), Shan State Army-North (SSA-N), Myanmar National Democratic Alliance Army (MNDAA)—and Ta’ang National Liberation Army (TNLA), attended the conference. The meeting, hosted by Wa and Mongla ethnic groups from the mountainous region of eastern Myanmar’s Shan state on the border with China, was held at the headquarters of the United Wa State Army (UWSA)—Myanmar’s largest nonstate militia—in Pangkham, the administrative capital of the militia's territory. UWSA chairman Bao Youxing told delegates at the meeting in Pangkham that “a new path to peace” is necessary because the government’s efforts to get other ethnic militias to sign the NCA have lost their momentum.